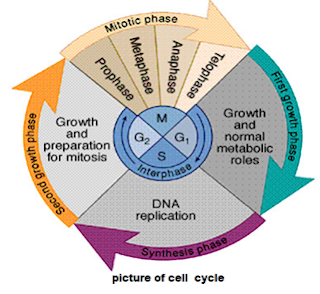 The cell cycle, or cell-division cycle, is the series of events of Cell division and duplication (replication). cycle. This type of cell division in eukaryotes is known as mitosis. The S phase starts when DNA synthesis (or replication). The cell then enters the G2 phase, which lasts until the cell enters mitosis. G2 phase is a period of metabolic activity and growth. During this phase the cell makes final preparations for division. blood cells must divide at a rate of 2.5 million per second). Others, such as nerve cells, lose their capability to divide once they reach maturity. removed. The division continues until the liver reaches its former size. Cancer cells are those which undergo a series of rapid divisions such that the daughter cells divide before they have reached "functional maturity". dividing, they stop usually at a point late in the G1 phase, the R point (for restriction). to 1 1/2 hours, depending on the kind of tissue being duplicated. do not have nuclei nor do the red blood cells themselves. including those of humans, spend at least 90% of their time in interphase. to opposite sides of the nucleus. At the same time, the nuclear membrane begins to break down. doubled chromosome becomes attached by thread-like spindle fibers to the centrioles which are at polar opposite sides of the cell. divides between the two new cells, and the cell membrane begins to pinch off the cell contents into two daughter cells. no longer visible, they will be replicated just before mitosis begins.